Come and join the colossal fun here at Giant Bingo. Everything is on the large side at this Dragonfish powered site and there is even a £5 no risk offer to get you started, join now and see for yourself! Register with Giant Bingo now and experience the games on offer thanks to the £5 no deposit bonus. Signing up is extremely quick and easy and the no risk funds will be immediately credited to your account after submitting valid credit or debit card details during the registration process. Players that go on to make a deposit will find a 200% match applied to their first deposit which gives even more free cash to splash! Such a giant site wouldn’t stop there with the bonuses. Carry on reading below to find two codes which will give you an even bigger wallet! 3rd deposit – Use the code MONEY and get double the fun with a 100% bonus funds . There is a hulking jackpot ready to be won every single day of the week. Prizes and card prices change daily but can reach up to £2500 in cash or 1 million giant points. 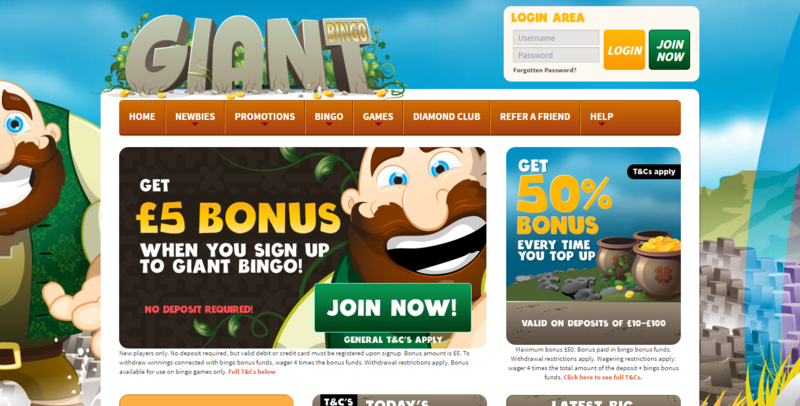 Finn the Giant loves happy bingo players, so every deposit you make will be topped up with 50% bonus. The best part is no code is required as the process is fully automated. 1 penny jackpots games – There is a £50 jackpot up for grabs 6x a day, check the schedule on for the times. Between 9am til midnight Finn hands out 16 pots of gold worth a combined £1200 cash. Jackpots alternate between £50 and £100 and cards cost 5p and 10p. .
Fi-Fo-Fun your way to as much as £5000 every Sunday from 9pm. The quicker you call bingo the greater the prize. The prizes and bingo are giant here but that doesn’t mean the site has to be! Members can play on their smartphones and tablets by simply typing giantbingo.com into a mobile browser. The site may become small to adjust to the size of your screen, but the mammoth fun remains. As you would expect from a site with Giant Bingo as its name, there is a humongous choice of bingo games here which are designed to cater to all players. Those that enjoy hulking prizes will enjoy the 5 progressive rooms that are on offer, whilst players who want to play for a guaranteed jackpot will find a game that suits them every day where prizes reach up to £2.5K. There is even a free bingo room open to all players with chances to win bundles of cash no matter if they are funded or not. All games play with 90 or 75 balls plus there is a 5 line pjp. A giant offering would not be complete without plenty of side games and this site does not disappoint. Choose from an array of mini games, slots, scratch cards or table games. Take a spin on one of their progressive slots and you could walk away with £30,000! Similar to Cassava sister sites like Farmyard Bingo.